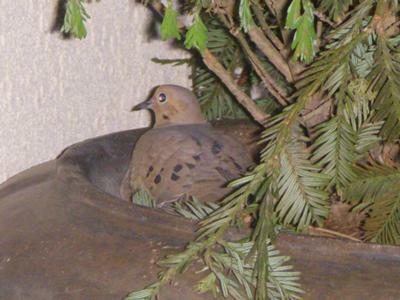 Two weeks ago we opened our front door and a dove flew out of the flower pot that is on the rail of our front porch. 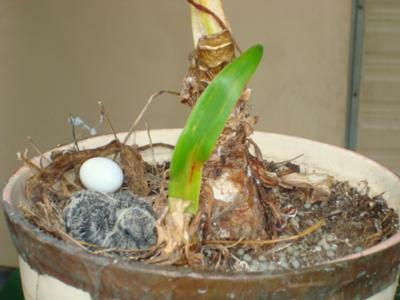 I quickly noticed that it had made a nest in the pot with one egg. The next day, there were two eggs. The first few days every time we went in and out of the house the dove would fly away but soon it didn't seem bothered by us and would just stay on the nest as we would come and go. We have observed the male and female trading off time on the eggs and now one of the eggs has hatched. When they fly off, one doesn't go far, they observe from either the fence or the neighbors roof. Knowing that cats are a big problem, and we do have a cat that comes around every other day, though he is quite old and doesn't see too well and hasn't noticed the doves or the nest thankfully. He has walked by into the house many times over the last two weeks, clueless. We did initially try to move the pot, slowly and only a foot away, though that didn't work. 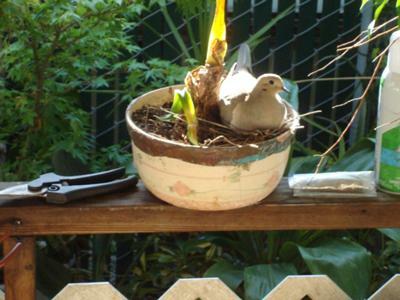 the doves went crazy, landing where the pot had been in a frenzy, so we moved the pot back and they calmed down. Aside from the nest being on a rail that a cat could easily get to, we were concerned that the nest was too low and possibly visible to crows. But since our first attempt at moving the nest failed we are afraid to try again and are just observing, hoping that nothing happens to the babies. We are also hoping that the second egg hatches soon, crossing our fingers. So Sorry that is so sad. We have a couple that comes back every year to nest on our upper window sill outside. The result is usually not good. The eggs roll off the edge. This girl needs some nest building skills. I feel bad for her, maybe this year she will do better! She was out there earlier hooting like crazy. such a sweet sound. All Doves will mate again in time. I would advise not throwing seed on the ground where it makes doves vulnerable to cats, and hawks. 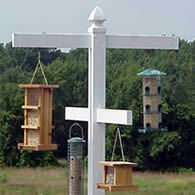 Place a tray feeder on a pole close to or under a tree for hawk protection. Do not do anything with the nest. Most likely it will be abandoned. I'm glad to see and hear your beautiful experience with your doves. I write to you with heavy heart hoping someone hears my, now lonely dove. 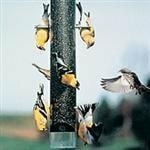 I've been throwing bird seed the past year out front and on occasion have had trouble with my neighbors cat. After having animal control put a stop to it she's now letting it out again and it finally got one of my dove couple. I've heard the one left behind calling all day around the neighborhood heart broken. We both are. Knowing they mate for life and spend their life alone should anything like this happen, can anyone shed any light? Can I do anything for the one that cries all day? A few Sunday's ago my Husband noticed a sparse twig nest in the urn of our topiary. In that nest we found a single egg. Coincidentally, just the day before, I had noticed, in the corner of our yard, what appeared to be the remains of a bird, that had obviously become prey to one of the many cats that roam our neighborhood. I know very little about birds but do know morning doves are monogamous, and as such immediately realized we likely had a sole mother-bird in our topiary attempting to care for & raise her young. I went on line and learned this was possible to do, but a long shot. I shared the information with my husband, and we set about doing the best we could to improve the odds of her success. We camouflaged her nest by adding chicken wire to the topiary, then draping branches & leaves over the wire mesh. This made her nest much less conspicuous to predators. We then realized she would be doing "double duty" as a single parent. So after the hatching of the 1st egg, (we believe Saturday) we began to "spoon-in" bird seed with a long handled wooden spoon. By standing as far away from the Urn, as possible we were able to deposit some seed, near the nest. I am unsure as to whether this tactic has helped, since we just began this effort today. 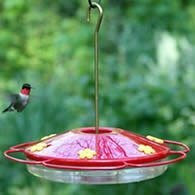 Its noteworthy to add, that she seems to now realize we are attempting to help, and she does not fly from the nest, even when we are within inches. It is interesting, that indeed 1 egg has hatched, as of yesterday (our 3rd Sunday since discovering the situation) and can only presume the 2nd will hatch shortly if not already. Since we are certain her mate has been killed, we have noticed another Dove who is staying in our yard and appears to be somewhat of a "look out" for our mother Dove; acting as a decoy when scrub Jays or other predators arrive. This 2nd Dove is always nearby & when another bird approaches the yard- will swoop out, & basically get the other bird's attention and cause the offending bird to move on. Since we are not versed in Dove behavior, we are uncertain as to whether this is a male, who has decided to "adopt or foster" our lone female and her new family. Your article reiterated what I had read previously, and that is that her success in this endeavor is a long shot at best. Regardless, my Husband & I are committed to helping her in any way that might better her odds. Please keep a positive thought out there for Us and Her! Touched by all your stories. My backyard dove is nesting in my hanging strawberry basket. Ignoring the drip line that goes off on her daily. And since it is on a line for many of the backyard plants, I cannot turn it off. If she ever moves I could individually. My problem is she is in the open. Camouflaged well in the basket itself, but easy hawk prey. What do you think if I tried to move the whole basket with her in it to another shepherd hook and to a shaded spot out of the open? Or would a stick and some draping be better? If that is the case, will she be able to fly in and out ok? 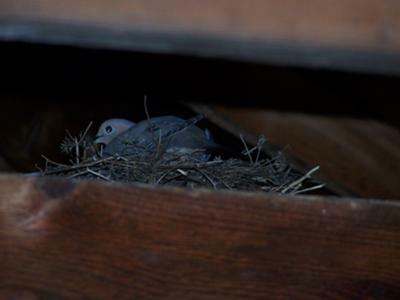 We kept hearing cooing at our front door May 2011 and then discovered a dove was nesting up in our eves of our roof (first photo). It is actually an overhang/extension from our garage of a walkway to our front door. I got a few good photos of one of the doves on the nest first and then July 12 (second and third photo) I got up on a stool and tried to take photos from a distance and got an adult and two babies. About four or so days after that one baby left the nest and then a day later the other baby left the nest after it seemed like it cuddled up in the corner right at our front door. I opened the door which startled it and it flew away but flew too high and ran right into the main board of the overhang but flew off. Now, this morning, 7/22 both adult birds are back and mom up on the nest with male up on roof close by. Maybe we are in for batch number two of babies. We shall see. We love the cooing and I love my birds. 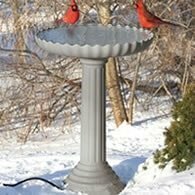 Starting April 14th a pair of Mourning Doves would fly under my Gazebo that's on my backyard deck less than 6ft from my kitchen window and sliding doors. The pair was looking for a place to nest. I have most of my deck/patio furniture pulled together in the middle of the deck to keep from getting weathered while we still have rain here in Campbell, CA. I have a chair in the very middle on top of my patio table that's covered and has a dip in the center...yes this is where the pair we've named Bonnie & Clyde started building their nest on 4/16 and continued for 3 days. The male would bring small twigs, soft large leaves and other debris from my yard. The male "Clyde" would drop the chosen bedding and the female "Bonnie" would move it to where she preferred it. Bonnie has been laying on the nest for 4 days and I haven't seen Clyde. 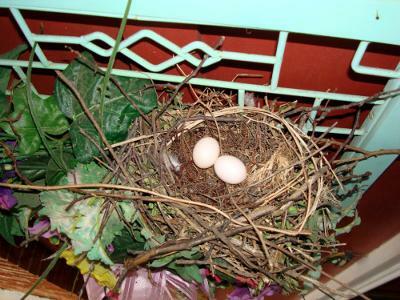 We are hoping Clyde shows up in the evening and relieves Bonnie to sit on eggs but we haven't noticed this yet. I was worried Clyde was missing as we have a neighbor cat who is an avid hunter and Mourning Doves are ground feeders. I've read the male will take nest incubation cycle at night and the female will swap in the morning...we so are hoping this is the case. I'll be heart broken if she has to abandon the nest due to no relief. I'm attaching a picture of Bonnie & Clyde as they were busy building their nest and I hope to update as the weeks pass. We will also assume there are two eggs in the nest, I don't want to bother the pair and attempt a peek. We have a lot of ivy growing across our dining room windows. 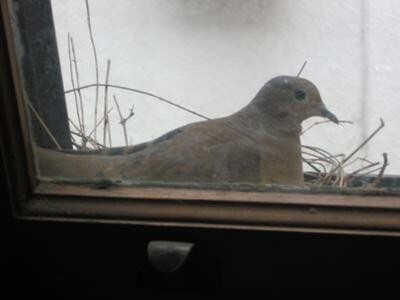 Early this spring we had noticed a mourning dove, often sitting on the windowsill and cooing. It sounded like it was in the house with us! It must have felt safe there, because it soon built a nest and was sitting there all the time. I noticed that once it had built its nest, it stopped cooing. It seemed curious, but not frightened at the nosy neighbors who kept looking out the window at it. 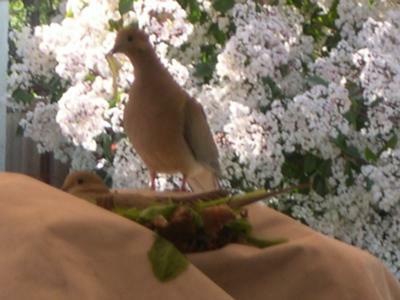 Last week a little dove appeared in the nest and the parent was feeding it. A few days later I saw just the baby and an egg in the nest- apparently Junior had been left to babysit. The daddy came back soon, but left Junior in charge from time to time during the day. I can actually see him breathing, the nest is so close! Days later, the second egg still has not hatched, and the parents are away from the nest more and more. Could the egg be a dud, and the parents are aware of that somehow? I don't think they would leave the egg uncovered otherwise. Soon Junior will learn to fly- I saw him stretching his wings today! I hope the parents like it here enough to raise another family. 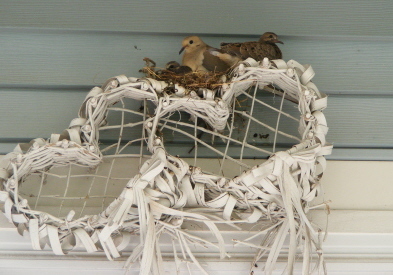 A pair of mourning doves has set up residence on top of a heart shaped hanging basket on our front porch. Last year they started building a nest in there but got spooked and never came back, I would see them around the yard though. But this Spring, they came back and built a nice little nest and laid their eggs in it. We come and go from our house right from the porch next to their nest, but they don't seem to be too bothered by us. So far this spring, they hatched one pair of baby doves successfully. It has been so exciting and interesting to watch the whole process. The day the babies hatched I saw them stretching their little heads up with their beaks wide open like you would see in a picture book, so cute! Right after they hatched, some squirrels discovered them. I caught the squirrels climbing up the screen of the window to get to the nest, I went out there and the squirrel was tugging on the hanging basket but I scared it away! The mother bird flew away while this was happening. I peaked in and saw that the babies were okay. I was so worried that the mother wouldn't come back, but she did after a couple hours. My husband thought to remove the screen out of the window and now the squirrels can't climb up there anymore. The baby doves grew up so fast! 2 weeks later I saw them fly away, one right after the other. One parent flew to the grass a few feet away and called to them, one flew to him first, then the second one took a few minutes flapping his wings and getting up the courage and then flew off too. I didn't see the birds for almost a week after that, I thought that was the end of it. But today they are back, and now incubating a second brood! 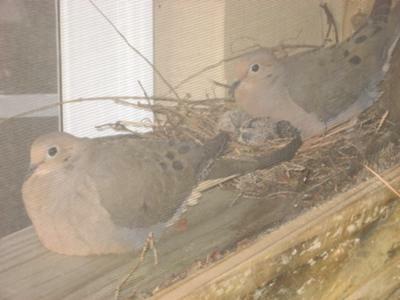 For the last couple of years I have had a dove nest and raising young on my bedroom window AC unit. Adding seeds even near a nest site can invite predators. The adults do not need the help. 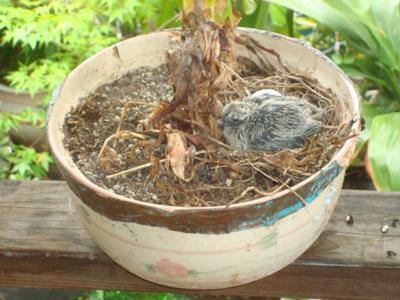 I have a Mama Mourning Dove nesting 2 chicks on my hanging planter. 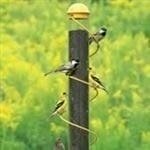 I wonder if i can sprinkle some seeds on their hanging planter nest..? Will it bother them and abandon the nest? I'm gonna be a Grandma! I have a wall decoration beside my front door that I've wanted to replace but, before I could do so, twigs were being placed on top of it, and with twigs scattered below on my protected porch. 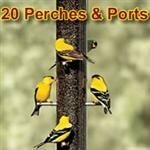 Now I was curious as to what type of bird will be my next tenant/s, so I waited to find out. 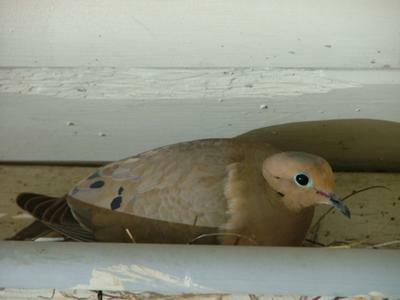 The following day, I saw a mourning dove sitting on the nest. I just had to find out how many eggs were in there and, while the parent was gone, I took a few pictures. I've taken pictures every so often during the first week. After 8 days and not seeing any changes to the two little white eggs, I began to fear that the eggs were not going to hatch. Online, I found this website that gave just the information I was looking for...thank you! I've posted a sign "Caution, bird's nest by front door." I've had a few surprised visitors, and I didn't want to spook the parent. I decided to personally not use the front door, but the garage entry during this time. Every time I walk by the porch, I would talk to the parent, and reminding them that they could stay as long as they wanted and that I wasn't going to hurt them, but protect them as best I could. Perhaps they are not afraid of me anymore because I've managed to get within 3 feet of the nest without them being startled or fly away. And, yes, there are two different doves taking turns on the nest...one has a bigger head than the other and black markings on the wings are slightly different. I'm also archiving this event for my 4.5 year-old grand-daughter, Ava Blythe, who lives 6.5 hours west of me in St. Louis. Am posting these pictures on Facebook so others can enjoy the adventure, too! 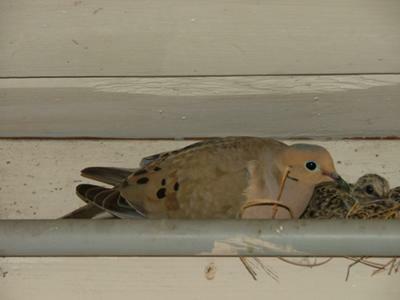 Two years ago we had a morning dove build a nest in our garage rafters on a canoe paddle. We never moved the nest so this year saw another dove checking out the property. I was thinking they would use the old nest, but what they did was build on top of the original so now we have a dove high rise on our canoe paddle. We often have stray cats in our neighborhood so I have not been parking the car in the garage. the cats use it as a launching pad to hunt in the garage rafters. I do not close the garage door so the doves can come and go and not be locked out of the garage. 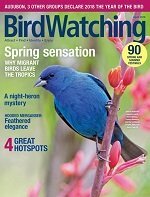 I was very concerned that the one dove was somewhat stranded tending the nest and eggs on her own till I came to the website and read that they do shift work. I was also surprised one day to drive into the driveway and see that one egg was just balancing on a rafter beam next to the nest. I am assuming there was something wrong with it and they pushed it out of the nest. My husband tried to retrieve it and put it in the nest, but it was cracked and fell apart when he touched it. The Dove never left the nest the whole time and his head and hands were withing a foot of her while trying to replace the egg in the nest. A dove couple appeared on my balcony rail to coo and mate in early February. 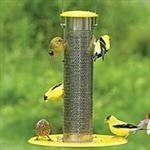 My bird feeder had already attracted other birds, the doves fit right in. Their pairing was obvious. This dove couple began "hanging out" on my brick windowsill, right outside my living room window. I live on the second floor, the predator safety factor is "high" for them, and this "birds-eye view" with caution (read their mating habits) was gifted me. My first grandchild, Clara Augusta, was born February 16. 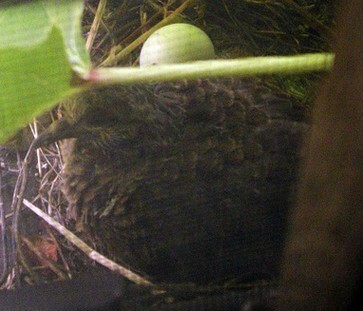 One week after her birth; when I came home an egg in the nest greeted me on the windowsill! I felt it was meant to be, eggs in wait, after helping birth my new grandbaby...and for by chance, the bird was absent from the early nest, and that was the only time, so I was able to snap a picture of the egg. The second egg appeared 3 days later-and I was able to find photograph it too. As February turned into March, the parent dove(s) have continued to incubate the eggs, with no opportunity for empty nest/egg photos. I assume the male and female switch turns on the nest. 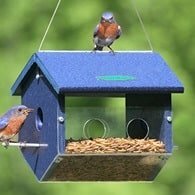 The question of whether it is one bird sitting continuously on the nest, not taking food or water, led me to this site and answered my question. I watch my son and daughter-in-law cooperate in caring for their new sweet baby girl. I live close by and lend my whole support to their duo. On my own windowsill I have a micro-cosm of the human scenario demonstrated by these mated doves I watch (with caution), as they bring their own new young into the world. Morning Doves Move Into New House With Us! 5 days old! Proud momma & daddy dove! We recently moved into our new home here in Indian Land, South Carolina on Feb. 25, 2009. 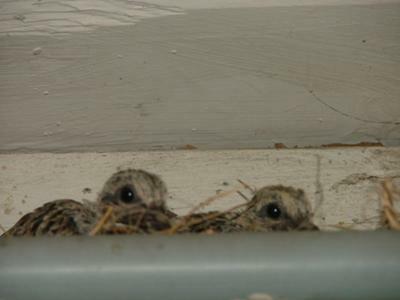 We noticed on our back screened in porch on the second floor that we had a small nest in the corner right as you come out the door from our kitchen. We could not believe that a dove would make a nest so close to where we could see it and so high above the ground! 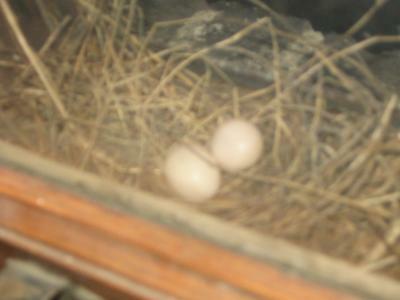 The 2 eggs were laid on March 20 & 22nd. The doves continually would trade places sitting on the nest every once and while. They would call to one another when it was time for the nest sitter to be relieved. We felt so bad for the doves. Their nest was built right where the rain dripped down from our roof. It has rained really hard several times and they got drenched! We have continually gone out the door and talked to them every day. They are very use to us. We are able to get so close that they let us take these wonderful photos along the way! On April 7th we realized the babies had hatched! We have been watching the adult birds call to one another to trade places feeding and taking care of the babies. It is so amazing watching how they let the birds nest in front of them and then they will sit on them and you can hardly see them underneath! We are very excited to see them fly in the next couple of weeks. We hope they will make it! We love watching them everyday and becoming their friends. We hope they will return to let us watch them raise another family again.